Color Magic is a unique paint or stain, that comes in a vibrant array of transparents, opaques, glitter coats and iridescents. Brilliant no-fire Color Magic™ stains and paints can be applied on metal, glass and other surfaces. Stains can be applied with brush, which is attached to the top of the bottle, airbrushed, sponged or with an eyedropper. Brush or spray onto a variety of surfaces such as glass, mirror, sandblasted designs, plaster, leather, wood, pottery, porcelain, shell, bone, beads, etc. Can also be used on metals including zinc, brass, copper, silver and tin. Requires no firing - dry to the touch in 10 minutes, but allow to cure for 24 hours - clean with solvent. 1/2oz. 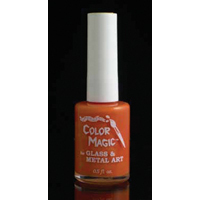 (15ml) bottle with applicator brush. Work in well-ventilated area: Read directions and caution label on bottle. Keep out of reach of children. Shake bottle well before using: The metallics, glitters and opaque stains settle; the bottles contain metal balls which help mix liquid. For best results, prior to use, turn the bottles upside down for 15 minutes. Shake gently (do not hold bottle by cap). Do not shake a partially filled bottle as vigorously as a full one. To Apply Stains: Use brush attached to top of bottle, artist brush, airbrush, or AirPen. Use Magic Outlining Pen to apply fine details. Since the colours are intense, one heavy coat of Color Magic™ is usually adequate on most surfaces. Drying Time: Although the stains appear to be dry to the touch in 10 minutes, allow to dry to a hard finish overnight. 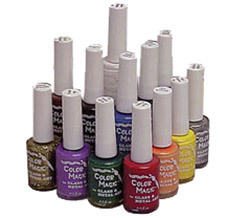 Color Magic™ drying times vary due to humidity and temperature. To speed up the drying process and enhance the curing of the UV sealant and colour stains, blow warm air from a hair dryer on the newly applied sealant or colour; or place in a warm (200°) oven for 45 minutes. UV Sealant: The UV Sealant adds a protective coat that inhibits stains from sun fading. Apply sealant after the stain application has dried 24 hours, and allow UV Sealant to dry for another 24 hours. Note: For glass placed in sunlight, it is recommended to apply UV Sealant on front and back of glass to prevent fading on either side. Glitter Coats: Use glitter coats for shimmering accents or apply over any colour. 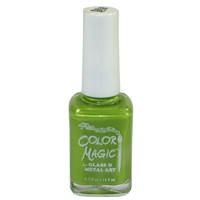 Storing: Store Color Magic™ tightly capped out of the sun in a cool, dry place. Solvent: Use Solvent/Thinner or denatured alcohol to remove excess stain from glass, metal or hands. Cleaning Completed Projects: Do not use harsh chemicals such as ammonia or glass cleaner. Clean with vinegar and water.